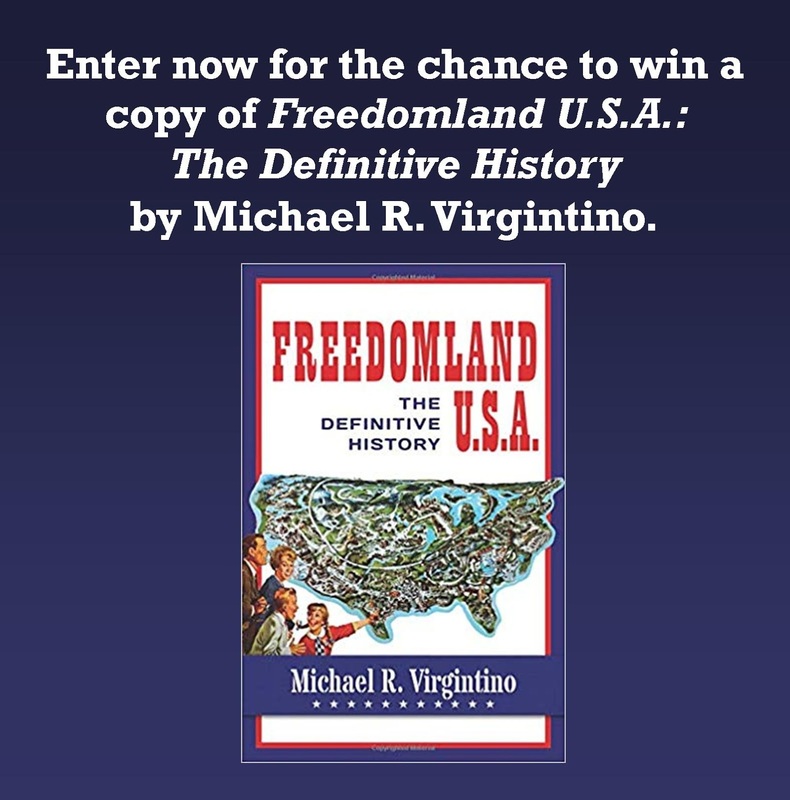 “Freedomland U.S.A.: The Definitive History” April 2019 Book Giveaway ~ The History Girl! Thanks to author Michael R. Virgintino and Theme Park Press, The History Girl is offering a chance to win a copy of Freedomland U.S.A.: The Definitive History. In order to be in the running, submit your name and e-mail address below! *By entering your e-mail address, you may receive periodic e-mails from The History Girl. Rest assured, your information is never sold or used by a third party or anyone else. Freedomland U.S.A.: The Definitive History is a new book that documents the entire story from conception to bankruptcy of one of the most innovative and beloved theme parks in America. The park was conceived and built by C.V. Wood. Known to many as Woody, he was Disneyland’s first employee and he brought Walt Disney’s imagination to life by leading the team that built Walt’s park. He then created Marco Engineering to build theme parks and other venues across the country. Located in New York City, Freedomland U.S.A. was celebrated as the “Disneyland of the East.” While it survived only five seasons (1960-1964), to this day the park generates fond memories among baby boomers who enjoyed its American history-themed attractions. The 300+-page tale includes first-time interviews with park employees and never before published photographs. *One entry per person. *Valid for all residents of the 50 United States of America, 13 years of age or older. *Entries without a valid e-mail address are not eligible. *Contest begins April 14, 2019 at 6:00 pm EST and ends April 20, 2019 at 8:00 pm EST. *The winner(s) will be chosen at random. *The winner(s) will be notified via e-mail on April 20, 2019 after 8:00 pm. The winner(s) must respond with a mailing address within thirty-six (36) hours or another winner will be chosen.